8 screws included for mounting the bracket onto the pc case. 4 screws for the hard disk. Color: Black. Maximize the internal space of your computer case for efficient usage. 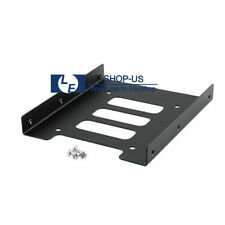 This dual drive bay mounting bracket kit let your 2.5 inch drives completely fits into a 3.5 inch drive bay. Supports two 2.5 inch HDD/ SSD in one 3.5 inch slot and provide space for additional PC components. 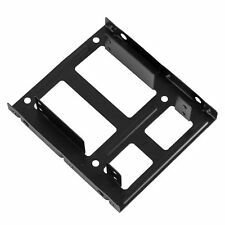 Secure SSD (solid state drive) or HDD (hard disk drive) mount for PC. Hard Drive Mounting Dock. Use this mounting dock to maximize the internal space of your computer case for efficient use. This durable mounting dock includes 8 screws to easily install onto the PC case. Jewelry Ring 1 Pcs Handstamped My story isn't over yet Semicolon Awareness. Earphone Headphone Jack Plug Lightning To 3.5mm Aux Adapter Cable For iPhone 7 8. Shisha E Pen Fruit Flavour Hookah Vapor Smoke Disposable Electronic 500 Puffs. This tray will allow you to mount one 2.5" SSD drive into one 3.5" drive space. 1 x 2.5 SSD HDD to 3.5 Mounting Adapter Bracket Dock. pls choose the first one. Remarks: any problem will be solved quickly if you choose the first reason. The inner side of the bracket has four inner columns corresponding to the four screw holes on the side of the hard disk, which fastens the hard disk and is very stable. Easy to install SSD/HDD to bracket. 2.5" to 3.5" SSD Mounting Adaptor Bracket. The easiest and safest way to mount your SSD Hard Drive. 1 xPlastic Mounting Adaptor Bracket. Universal Mounting Bracket. Material: Plastic. Fits any PC tower case. Features: SU303 2.5" to 3.5" All-Aluminum Hard Disk Rack (Floppy Drive 4 Positions Design). As long as the position can hold the 3.5" hard disk, the rack can be inserted. Made of the about 2mm/0.08" thick aluminum alloy, it's hard to deform and quick to dissipate the heat and provides the maximum protection for your hard drive. 2.5" to 3.5" SSD Mounting Adaptor Bracket. The easiest and safest way to mount your SSD Hard Drive. Universal Mounting Bracket. Our goal is to make sure that you can find exa ctly what you are looking for and make it easy for you to place your orders. There are 4 screws holes on the underside of this unit for mounting the bottom drive. So unlike the 2 piece design, where you need to slide the brackets around to make the holes fit. The top drive mount using the screw holes on the side. 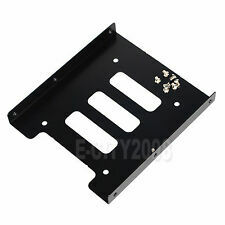 100% brand new and high quality.2.5" To 3.5" Mounting Adapter Bracket, works with HDD/SSD.Maximize the internal space of your computer case for efficient usage8pcs screws included for mounting the bracking onto the PC caseEasy to installMaterial: MetalColor: BlackSize: Approx. 12 x 10 x 1.4cm/ 4.72 x 3.94 x 0.55"Package Content:1 X 2.5" SSD HDD To 3.5" Mounting Adapter Bracket Dock Hard Drive Holder For PC8 X ScrewNote: Light shooting and different displays may cause the color of the item in the picture a little different from the real thing. The measurement allowed error is /- 1-3cm. Brand Unbranded MPN Does not apply UPC 191466326879 EAN 191466326879 ISBN 191466326879 UPC 191466326879 EAN 191466326879 ISBN 191466326879. It adopts precision mold once stamping and forming, and the effect is consistent and easy to install. Model: 2.5" to 3.5" desktop hard drive bracket. 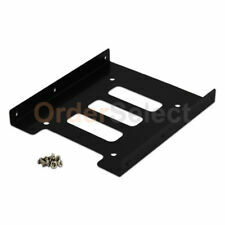 Product included: 1 × hard disk bracket, 8pcs × screws (4 fixed hard drives, 4 fixed brackets). 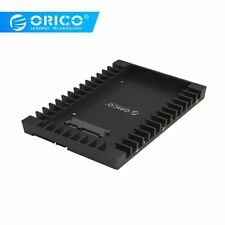 Suitable for all computer cases You can put 2.5 "IDE or SATA SSD and HDD converted to 3.5". KingShare KS-A325MBU1S 2.5" to 3.5" Rack / 1PCS. Product Details. 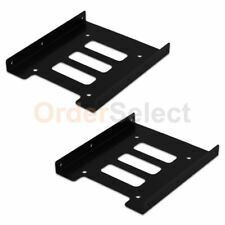 2 x 2.5" SSD HDD to 3.5" Mounting Adapter Bracket Bay Holder For PC Case(SSD/HDD not included). No screws required to install SSD into adapter. 2.5" To 3.5" Mounting Adapter Bracket. We might require you to send us photo/s of the item received and also your original item so we can compare and conduct necessary actions. SSD Useful Holder Double Hard Drive Mounting Bracket Adapter HDD 2.5" to 3.5"
(2) Twelve (12) screws included for mounting the bracket into the PC case. There are 4 screws holes on the underside of this unit for mounting the bottom drive. So unlike the 2 piece design, where you need to slide the brackets around to make the holes fit. Trending at $4.66eBay determines this price through a machine learned model of the product's sale prices within the last 90 days. Model: 2.5" to 3.5" desktop hard drive bracket. Product included: 1 × hard disk bracket, 8pcs × screws (4 fixed hard drives, 4 fixed brackets). Anyway we will try our best to avoid this kind of thing. Trending at $2.95eBay determines this price through a machine learned model of the product's sale prices within the last 90 days.